New Zealand has had the hottest summer on record and Niwa says the country can expect similarly warm summers over the coming years. Niwa figures show the average temperature nation-wide during the summer months was 18.8°C, which is 0.3°C above the previous record set in 1934-35. The seas around New Zealand saw temperatures that were 6°C above average, while a high of 38.7°C in Alexandra on 30 January was the country's hottest January temperature in 39 years. January 2018 was the hottest month on record for New Zealand, while it was the second warmest December on record. 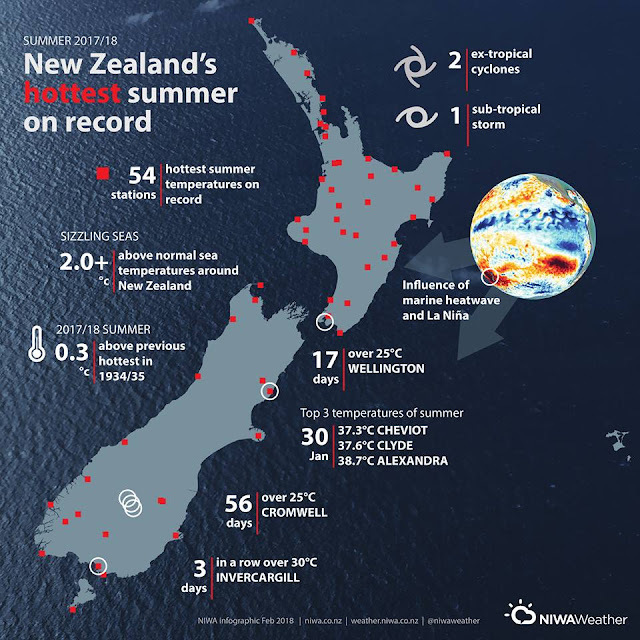 Niwa said 54 locations across New Zealand recorded their hottest summer on record, 39 their second-hottest and nine their third-hottest. Among the six main centres, Auckland was the warmest over summer, Dunedin was the coolest and driest, Wellington was the sunniest, and Hamilton was the wettest and least sunny. Niwa principal forecasting scientist Chris Brandolino told Morning Report the record-breaking summer was not too surprising. "When we get these things happening, like a really warm ocean because of the marine heatwave - we've had really warm ocean temperatures going back to November - and when we have winds coming from the north, more than usual, you're going to get really warm weather. "However, I think the difference-maker is we have climate change now. Our Earth is warmer than it was 20 years ago, 50 years ago, 100 years ago. When you have these conditions coming together like they did, no, it's not too surprising." He said similar record temperatures were likely to continue as long as carbon emissions remained high. "It doesn't mean every single day, doesn't mean every single season or week or month is going to be record-breaking and warm, but the principle or the expectation as we work our way through the coming decades, if we're on the same trajectory with carbon emissions, this will continue."